So, you’re looking for a business partner and you want to evaluate your prospect to determine if it they are going to be a good fit. 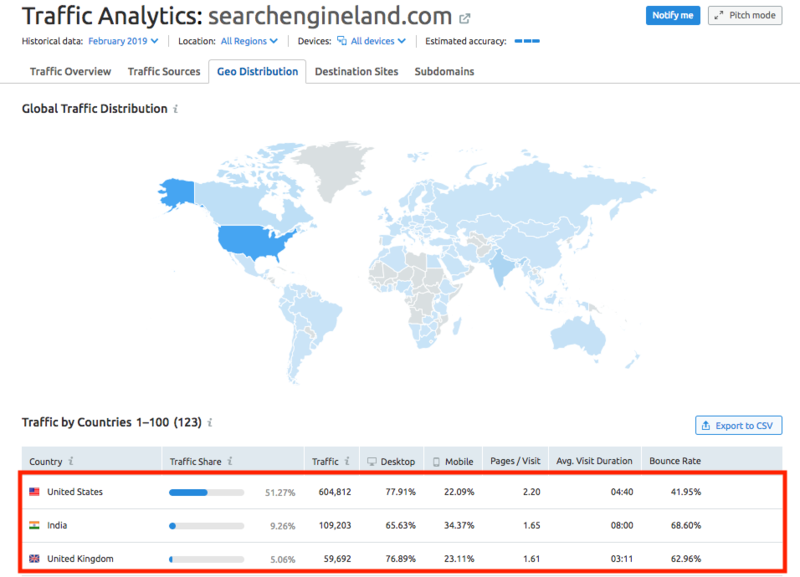 How can you make your decision based on SEMrush data? Follow these steps to use Traffic Analytics data to get an understanding of your business partner prospect based on the traffic to their domain. 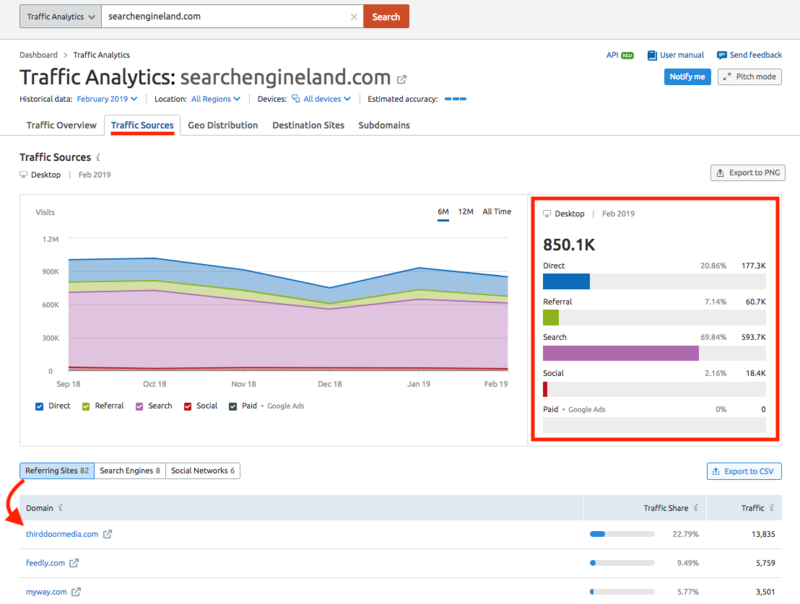 To start, enter the domain name of your prospective partner into the Traffic Analytics tool. Visits and unique visits per month will give you an immediate barometer of this business’s reach. If the business is a SaaS, media outlet, or ecommerce, their overall website traffic is a reflection of their audience size. This will be visible at the top of the Traffic Overview report. The number of visits and unique visits represent our estimate for the previous month. Are they in the range of 1,000-10,000 visits per month, do they attract more than 100,000 or are they in the millions? This metric will let you size up the prospect and their audience. Now, perhaps more important than the size of the audience is the quality and engagement of this website traffic. The metrics to look for here are average pages per visit, visit duration, and bounce rate. This will tell you if a partner’s audience is highly engaged or just interacting on a surface level. The more pages per visit and longer visit duration, the more the audience is really engaging and spending time with the business - which would all be good signs for a potential partner. High bounce rate would be a red flag that people don’t like staying on this business’s website or it has technical problems. How much of your audiences are the same? You can quickly tell with the Audience Overlap widget how much percentage of your website traffic is also a part of your prospective partner’s website traffic. Enter your domain name in this tool and the website of your prospect as a “Competitor” with the “Add 4 competitors” button at the top of the report. Once you do that, you can scroll down the report to the Audience Overlap section. This displays your two audiences and what percentage is estimated to be overlapping. To save this chart, use the Export to PNG button. High audience overlap means that you’ve already made some contact with this audience and you’re targeting the same group of people. Low audience overlap indicates a new market opportunity because this prospect’s audience might not know about you yet. While whatever you consider high or low overlap is subjective to the industry your site operates in, an overlap of 50% or more would indicate that there is a strong connection between the audiences of these sites. What countries does your potential partner cover? Are they relevant to your business? The Geographic Distribution report will be the report to look at if you are interested in expanding to a specific geographic market through this potential partner. 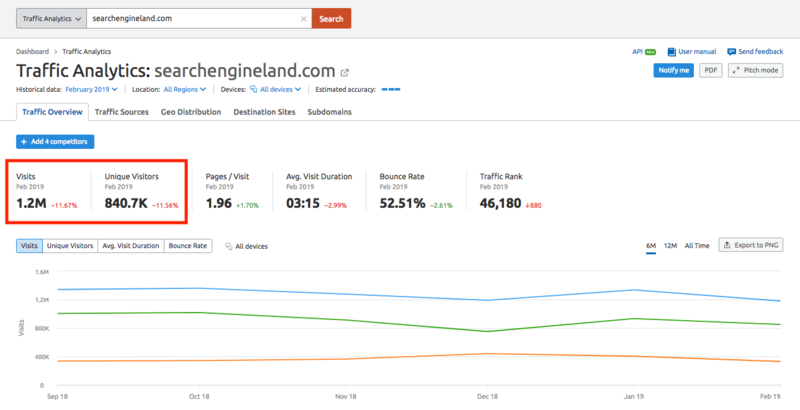 You can identify what percentage of their website’s traffic comes from those markets and how engaged their audiences are in each region (pages per visit, avg. 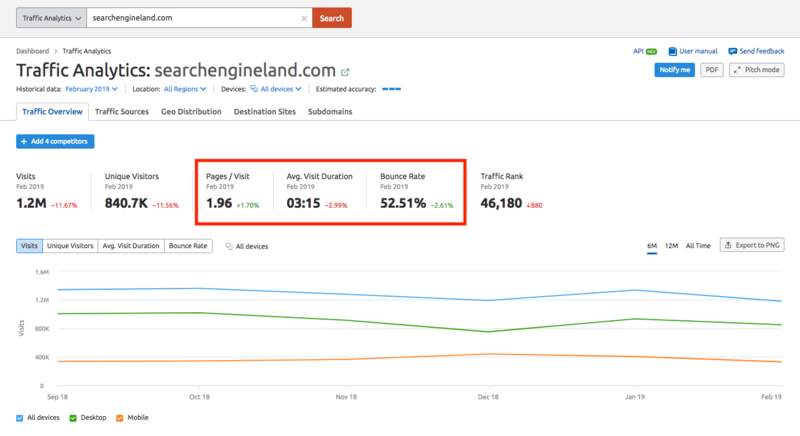 visit duration, bounce rate). Likewise, if you see that your site has great traffic in a region that your prospect does not, this is a great selling point to tell them that working with you would allow them to reach a new market for their business. Do you know where their traffic comes from? 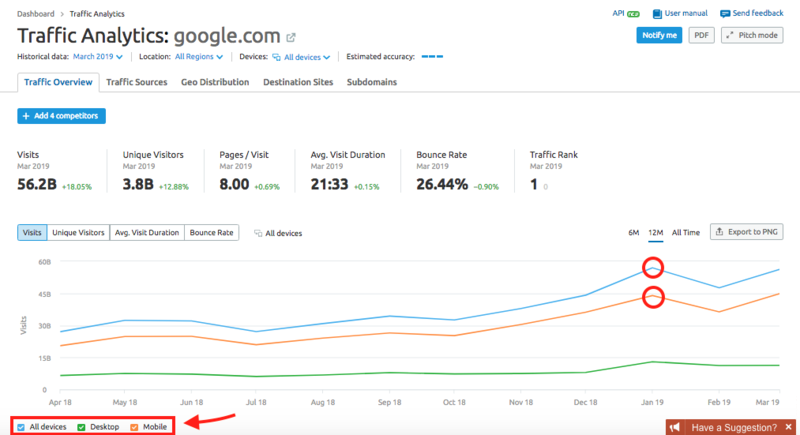 Using the Traffic Sources report you can see the division of their website traffic coming from search, social media, referrals, direct, and paid traffic (Google Ads). You can see the amount of each channel’s contribution to the site’s total traffic and look deeper into the specific top referring sites, search engines and social networks sending traffic to the site. This is another way to see their strengths and weaknesses in bringing traffic to their website. You can identify their top channels and make plans to leverage their strengths for your business. Again, if your site has a stronger performance than theirs in a specific traffic channel (let’s say they have tons of search traffic but no social traffic, meanwhile, you have hundreds of thousands of social visits per month), you can use that as a selling point for your partnership. If you look at their graph of traffic over the past 6 months, 12 months or all time, you can try to spot their trends. Do they receive spikes in some seasons but not others? Are they generally increasing or declining their total traffic? Note that it may be easier to spot trends if you change the time range to “All time” or “12M” above the report. The report below shows a site that had a big uptrend spike in January, but note that the spike was mainly occurring on mobile traffic. If they are on the rise, it is a good sign that they would be a valuable partner because you could capitalize on their growth as they continue to trend upwards. Lastly, you can identify a website’s top Destination Sites - or the most common websites that visitors go to after viewing their site. This will give you insight into their current partnerships and you can think about if these businesses could also be beneficial partners to you. Now, use the Traffic Analytics tool for these 7 steps when evaluating a prospective partner and you can rest assured your decisions are based on data. To save any of this data and prepare a presentation for any interested parties, use the PDF button at the top of Traffic Analytics to export and modify a PDF version of the data in this tool.